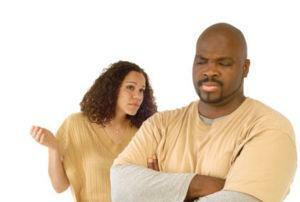 There are many barriers to communication and this can be detrimental to any relationship. Communication plays a major role in opening up and connecting with your mate. To have a good conversation with someone involves mutual respect, which is crucial in a loving partnership. Communication barriers usually block the meaning of the messages sent. These blocks cause misunderstandings and deliver unintentional messages. Some conversations are more susceptible, such as arguments. Message blocks are common when someone is in a conflict. During a disagreement, defenses inhibit a person's concentration of what the other person is saying. A lack of concentration results in poor listening skills and additional arguing. Even though conflicts are major barriers to communication, it is only one type of many you will find in conversations. It can be difficult to have a good conversation if you have objects in the way. Distance can be an issue as well if one person cannot hear clearly. The best way to speak with someone is to sit or stand across from him or her. Another form of physical roadblocks is distractions. If possible, make sure there are no interruptions or distractions during conversations. Sometimes while talking with your significant other, one person misperceives what the other is saying. This happens when you think your partner is upset over one thing but is actually upset about something else. These misunderstandings can lead to false feedback or advice that can make the person feel unheard. If you ever feel that you have the wrong perception, simply ask the person to clarify. This is a common barrier and can be difficult to avoid. Emotional stress can interfere with active listening. If you are having a hard day or going through something very personal, it is difficult to concentrate on what others are saying. When this is a problem, you will need to let your significant other know that it is a bad time but you would love to discuss it later. Many times in a relationship, couples do not have similar experiences. When this occurs, one person has a hard time following or concentrating. To be an active listener, you need to ask your partner to clarify what you do not understand and to be patient while you try to follow. You need to want to listen. If you do not feel that you can listen to that person, you need to let your partner know that you are not able to concentrate at that time. Ignoring what a person says fuels anger and resentment. Letting the person know that you are unable to listen because you are busy will prevent hard feeling between the two of you. Some people like to vent and not receive any advice. If you have a need to give advice excessively it can hurt the conversations you have with your partner. Unsolicited advice prevents some people from opening up. You may only be trying to help but instead your partner feels as though he or she cannot vent without having to hear more criticism. When in a conversation, try to step back and be supportive. Provide encouragement and let him or her know you are there if needed. Your partner will ask for advice if he or she is looking for it. Your non-verbal cues are just as important as your verbal language. What you are saying has to match what you are doing. If you say that you are listening but look the other way then you are sending a mixed message. Many people will stop talking if they feel that you are not paying attention even if you tell the person you are listening. Pay attention to your actions as well as your words when speaking with your significant other. Cultural differences are present in the way people communicate. You may find that some people will stand very close to you while talking while others stand further away. Another difference is that some cultures will not look at another person while talking which appears to send the wrong message. Understanding these cultural traditions can help you and your partner work through poor communication. Language and the definitions of words can be another problem due to issues with understanding, even if you speak the same language. Active listening is the best way to avoid blocks in communication. As your partner is talking, ask questions to clarify without interrupting. When your partner has finished discussing something, acknowledge that you were listening by saying, "I understand how difficult this must be for you." Your partner will appreciate that you heard the concerns and you are being empathetic.